Amid a nadir in ties with India, Nepal’s prime minister looks to China for an alternate source of economic opportunity. Nepal’s prime minister, Khadga Prasad Sharma Oli, is on a week-long visit to China this week. Oli, who became Nepal’s first elected prime minister under the newly promulgated constitution last October, is on his first trip to China and his second trip abroad overall after a visit to India last month. Oli’s trip comes at a time of unease in the historically close bilateral relationship between India and Nepal. Oli’s time in China has made it clear that Nepal, which relies economically on its giant neighbor to the south, is increasingly looking toward Beijing for an alternate source of economic ballast and opportunity. On Monday, Oli met his counterpart, Premier Li Keqiang, and Chinese President Xi Jinping in Beijing and voiced his support for China’s One Belt, One Road initiative, which endeavors to expand economic interconnectivity across the Eurasian landmass. Accordingly, China agreed to begin exploring the feasibility of connecting China’s rail network to Nepal. Given the natural barrier of the Himalayan range between Tibet and Nepal, transportation infrastructure between Nepal and China is limited. In addition to the issue of a possible Nepal-China rail link, Oli discussed a range of other issues. Critically, he secured transit rights for Nepali goods through China, a development that will help reduce Kathmandu’s reliance on India-based routes to seaports. 98 percent of Nepal’s trade with countries apart from India has to first transit Indian territory. Most Nepali sea-bound exports have to head to the Indian port city of Kolkata, according to the Indian foreign ministry. For landlocked Nepal, the acquisition of transit rights through China is a geoeconomic game-changer. According to the Nepal Times, China and Nepal concluded nine major agreements in total, in addition to the railway cooperation and transit rights agreement. The two countries will cooperate on the construction and maintenance of a bridge at the Xiarwa Boundary River. China will underwrite and support the Pokhara Regional International Airport Project in Nepal. The two sides will cooperate on energy, climate change, intellectual property, and begin exploring the feasibility of a free-trade agreement. Oli’s trip to Nepal has drawn a great deal of interest in India, where reporting on the visit has greatly outweighed Chinese coverage of the visit. As I’ve discussed before in The Diplomat, Kathmandu and New Delhi saw their relations strained last year amid differences over Nepal’s new constitution, which was seen by certain ethnic groups with close ties to India as discriminatory and unfair. The constitutional crisis was the acute event, leading to a flare-up in anti-India sentiment in the country, but calls in Nepal to rethink the country’s ties to India have long been part of the political discourse. Under the country’s old Maoist government, there was a serious push to scrap to the 1950 India-Nepal Treaty of Friendship, which provides the foundation for bilateral ties. The constitutional crisis reached its apex with the onset of a de facto blockade, which Nepal accused the Indian government of engineering as a form of leverage. New Delhi maintains the blockade was an organic development caused by truck drivers who were anxious about the security situation across the border, given widespread protests and instability. As a result of the blockade, fuel, food, medical supplies, and other goods were in short supply in Nepal, putting considerable economic stress on the country and raising anti-India sentiments. Oli’s visit to India in February was an attempt to set aside some of the ill-will generated during the months-long crisis, but appears to have been limited in its success. Contrary to New Delhi, Beijing took a placid “wait-and-see” approach to Nepal’s constitutional crisis. Additionally, China’s rush to send aid to Nepal following last year’s devastating earthquake in April left a positive impression of the country as well. 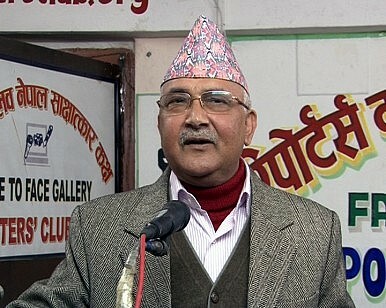 In a bid to send a message to India, reports in December suggested that Oli would break with the longstanding practice of many Nepali leaders (with a few exceptions) and visit China before he visited India. Oli didn’t end up doing that and rejected accusations that he had played the “China card” against India. In China, Oli has made it clear that he is willing and able to approach China should relations with India prove to have been irreparably damaged. In contrast to his recent trip to India, Oli will leave China with several ambitious initiatives and deliverables in tow. In India, Modi and Oli were unable to issue a joint statement or set an agenda that showed that the relationship had recovered its old character of closeness. India’s reaction to Nepal’s growing interest in hedging its options with a closer and more diversified relationship with China is yet to be seen. However, New Delhi likely won’t be satisfied to let Kathmandu drift toward Beijing, possibly precipitating a geopolitical tug-of-war. India should give Nepal no reason to tilt toward China.